i've been dying to try freezer paper stencils for ages (i swear i've had this roll of freezer paper stacked away in my cupboard for more than two years), but i was recently trying to figure out ways to make sam's old white onesies seem a little bit more special (before they get handed down) and decided that this is the perfect opportunity to finally give this stencil thing a go. i'm still not quite sure what i want to put on the onesies (can't do initials because she hasn't got a name yet, don't want to do hearts or flowers or other girlie stuff because that's just too, i don't know...the word boring comes to mind), so i thought i'd just experiment on my own t-shirts first (and even this was a stretch when it came down to it, hence the triangles). i think the end result was okay. 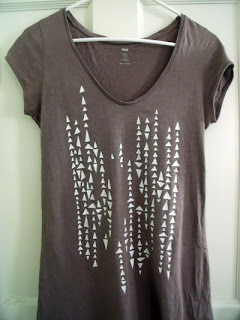 you can totally see places where i should've pressed harder with the iron when ironing on the stencil (or been more careful with the paint, or both), but now that i've done one, i'm totally hooked. i want to stencil everything! i love this inspiration, and i pinned a tutorial here. now what are you waiting for? i'm sure you've got an old, boring tee with a stain on it just waiting to be upgraded, don't you?